Terms used in business such as Expedited Charge,Expert System ,Export / Exportation,Export Broker,Export Factoring,Export Restraints etc. 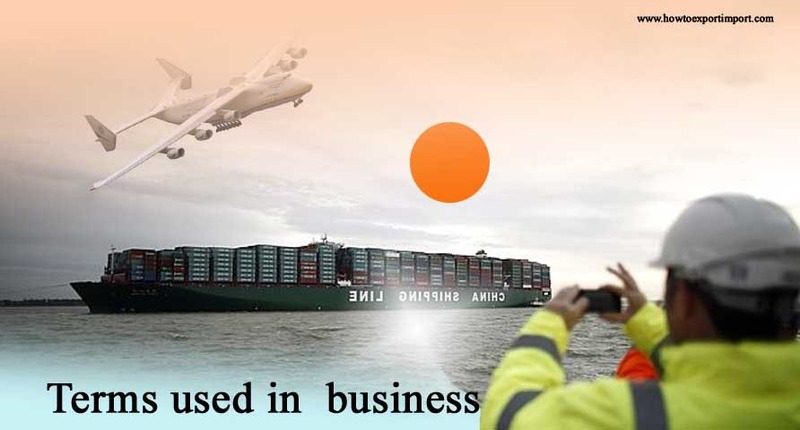 This post explains about terms used in business such as Exemption clauses ,Exit Strategy,Expedited Charge,Expert System ,Export / Exportation,Export Broker,Export Factoring,Export Restraints,Export Subsidies etc. These terms used in international business are arranged in alphabetical order and you may add more information about terms used in export business at the end of this article, if you wish. Executive Director - Also called Internal Director. A person who usually works as a full-time senior employee for a company, and is responsible for the day to day running of the business, and is often a member of the company's board of directors. Exemption clauses - clauses in a contract that attempt to restrict the liability of the party that writes them. These are split into exclusion clauses that try to exclude liability completely for specified outcomes, and limitation clauses that try to set a maximum on the amount of damages the party may have to pay if there is a failure of some part of the contract. Ex-Im Bank: The Export-Import Bank of the United States (Ex-Im Bank) is the official export credit agency of the United States. Ex-Im Bank’s mission is to assist in financing the export of US goods and services to international markets. Ex-Im Bank enables US companies — large and small — to turn export opportunities into real sales that helps to maintain and create US jobs and contribute to a stronger national economy.Ex-Im Bank does not compete with private sector lenders but provides export financing products that fill gaps in trade financing. We assume credit and country risks that the private sector is unable or unwilling to accept. We also help to level the playing field for US exporters by matching the financing that other governments provide to their exporters. Ex-Im Bank provides working capital guarantees (pre-export financing); export credit insurance; and loan guarantees and direct loans (buyer financing). No transaction is too large or too small. On average, 85% of Ex-Im Banks transactions directly benefit US small businesses. Exit Strategy - Also called Harvest Strategy. A plan by an investor to dispose of an investment, such as shares in a company, to make a profit, or a business owner to dispose of their company, e.g., by selling the business, floating it on the stock market, ceasing to trade, handing it over to another family member, etc. Expectancy Theory - A theory of motivation developed by Canadian Victor Vroom, Yale professor of management and psychology, established in his 1964 book, Work and Motivation, which essentially states that motivation necessarily comprises and is determined by three elements of belief: Effort will produce success,Success will produce reward,These outcomes will be personally satisfying. Expedited Charge - A charge payable to the Carrier by the subscriber for installation of service within a shorter period of time than is convenient for the Carrier. expense account: amount of money that an employee or group of employees can draw on to reclaim personal expenses incurred in carrying out activities for an organization. Expenses - Any costs that go along with the sales made to customers in this period. It does not matter when these bills were paid, only that they are matched to the sales that are listed. Expenses: personal costs incurred by an employee in carrying out activities for an organization that are reimbursed by the employer. Experience Curve - In business, when costs fall and production increases as a result of increase in workers skills and lower material costs. Expert System - A computer software system which can provide expert knowledge for a specific problem when users ask a series of questions. Export / Exportation :To send an item, a service, an idea or a person from one country to another to be sold. Export agent: an intermediary who acts on behalf of a company to open up or develop a market in a foreign country. Export agents are often paid a commission on all sales and may have exclusive rights in a particular geographic area. Export credit / Crédit export :This technique covers all the financing mechanisms to which an exporter may use. The different types of export credit are the so-called administered credits, purely secured credit and open credit (simple bank credit). These different types of credit can be divided into two groups: buyer's credit, which is a form of credit granted to the buyer to allow him to settle his debt in cash; and supplier credit, which is a discount on the debt held by the buyer who has granted a term of payment to his buyer. Export Credit - A loan taken out by an importer with a bank in an exporters country, so that the importer can buy foreign goods and pay for them at a later date. Export Factoring - A facility offered by banks to exporters. The bank is responsible for collecting payments for exported goods, so that the exporter can borrow money from the bank before the goods have been paid for by the customers. Export licence (import licence) / Licence d'exportation (d'importation) :The licence is an administrative document to control external trade, authorising the import or export of certain products subject to the quota regime. Document delivered, as a counterpart for a security, by the agricultural authorities to export certain agricultural products to countries outside the European Union. Exporting: the process of selling goods to other countries. Exposition - A public event at which businesses, that produce related goods, can showcase their products and/or services. Express terms - the terms actually stated in the contract. These can be the written terms, or verbal ones agreed before or at the time the contract is made - see implied terms. Expressions of interest:A published notice inviting businesses to register their interest in a future procurement. The government agency may use the information provided as a basis for conducting a future limited or selective offer process. Registering your interest for an expression of interest does not guarantee that you will be invited for a future approach to market, or that the procurement will ultimately proceed.